Niki Alling's Blog: Thanks Coach! Sports are such a big part of our lives. We send our kids to play, we watch them on TV, but how much do we really appreciate our Coaches? They work hard to teach our children teamwork, and commitment, while still having fun. I wrote this poem for all the coaches out there, and for those of you who would like a new way to say thank you. 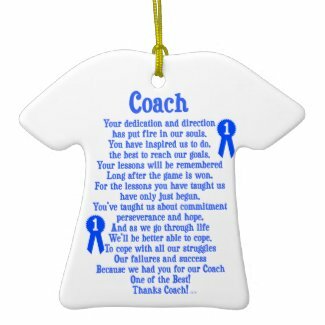 This poem can be found on a variety of gifts in the Sports - Coach section my Zazzle store; NikiClix Creations.